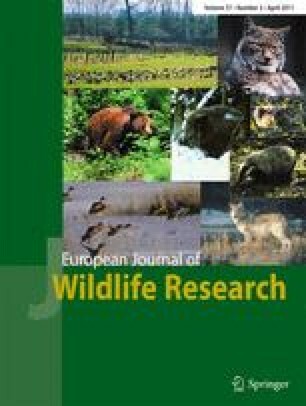 One of the main factors involved in the decline in the European wild rabbit in the Iberian Peninsula is the loss of suitable habitats caused by abandonment of agricultural and grazing activities. Nowadays, Mediterranean landscapes suffer from wildfires that affect extensive areas and produce considerable habitat changes. However, little is known about the influence of wildfires and post-fire treatments on rabbit abundance to address policies to recover their populations. To do so, we studied abundances of this species in four types of plots during three consecutive years after a wildfire in Catalonia (NE Spain): (A) unburnt forests, (B) burnt forests with removal of burnt trees but with branches left, (C) burnt forests with removal of burnt trees and branches, and (D) non-forested burnt plots. Rabbits progressively colonised burnt plots, where their abundance increased for at least 5 years after the fire, but decreased or even disappeared in unburnt ones, indicating that forest fires have a positive effect on rabbit populations. Although abundances did not differ between the three burnt plot types, plots with removal of burnt branches had the highest increase in abundance. In addition, soil covered by branches or by dense vegetation appeared negatively correlated with abundance, indicating that this could hinder rabbit movements, while some plant species could benefit rabbits by providing high quality food. Thus, post-fire treatments favourable to rabbit populations might therefore be a good way of increasing the conservation and economic value of areas affected by forest fires. This study was commissioned by the project “Conveni de Col·laboració entre la Caixa d’Estalvis i Pensions i la Diputació de Barcelona per al desenvolupament del Pla de gestió integral per a la conservació dels sistemes naturals de la xarxa de Parcs Naturals de la Diputació de Barcelona”. We are deeply indebted to Carles Castell, Martí Doménech, Ramon Espinach, Daniel Guinart, Feliu Madaula, Àngel Miño and Jordi Riera, from “Àrea d’Espais Naturals de la Diputació de Barcelona”. Francesc Parés made a huge contribution during the fieldwork. Two anonymous referees provided very helpful comments on earlier drafts of the manuscript.